Confessions (Latin: Confessiones) is the name of an autobiographical work, consisting of 13 books, by Saint Augustine of Hippo, written in Latin between AD 397 and 400. The work outlines Saint Augustine's sinful youth and his conversion to Christianity. Modern English translations of it are sometimes published under the title The Confessions of Saint Augustine in order to distinguish the book from other books with similar titles. Its original title was Confessions in Thirteen Books, and it was composed to be read out loud with each book being a complete unit. Confessions is generally considered one of Augustine's most important texts. 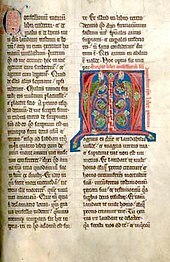 It is widely seen as the first Western autobiography ever written, and was an influential model for Christian writers throughout the Middle Ages. Professor Henry Chadwick wrote that Confessions will "always rank among the great masterpieces of western literature". The work is not a complete autobiography, as it was written during Saint Augustine's early 40s and he lived long afterwards, producing another important work, City of God (book) . Nonetheless, it does provide an unbroken record of his development of thought and is the most complete record of any single person from the 4th and 5th centuries. It is a significant theological work, featuring spiritual meditations and insights. In the work, Augustine writes about how much he regrets having led a sinful and immoral life. He discusses his regrets for following the Manichaean religion and believing in astrology. He writes about Nebridius's role in helping to persuade him that astrology was not only incorrect but evil, and Saint Ambrose's role in his conversion to Christianity. The first nine books are autobiographical and the last four are commentary and significantly more philosophical. He shows intense sorrow for his sexual sins and writes on the importance of sexual morality. The books were written as prayers to God, thus the title, based on the Psalms of David; and it begins with "For Thou hast made us for Thyself and our hearts are restless till they rest in Thee." The work is thought to be divisible into books which symbolize various aspects of the Trinity and trinitarian belief. His infancy, and boyhood up to age 14. Starting with his infancy, Saint Augustine reflects on his personal childhood in order to draw universal conclusions about the nature of infancy: the child is inherently violent if left to its own devices because of Original Sin. Later, he reflects on choosing pleasure and reading secular literature over studying Scripture, choices which he later comes to understand as ones for which he deserved the punishment of his teachers, although he did not recognize that during his childhood. Augustine continues to reflect on his adolescence during which he recounts two examples of his grave sins that he committed as a sixteen-year-old: the development of his God-less lust and the theft of a pear from his neighbor's orchard, despite never wanting for food. In this book, he explores the question of why he and his friends stole pears when he had many better pears of his own. He explains the feelings he experienced as he ate the pears and threw the rest away to the pigs. Augustine argues that he most likely would not have stolen anything had he not been in the company of others who could share in his sin. He begins the study of rhetoric at Carthage, where he develops a love of wisdom through his exposure to Cicero's Hortensius. He blames his pride for lacking faith in Scripture, so he finds a way to seek truth regarding good and evil through Manichaeism. At the end of this book, his mother, Monica, dreams about her son's re-conversion to Catholic doctrine. Between the ages of 19 and 28, Augustine forms a relationship with an unnamed woman who, though faithful, is not his lawfully wedded wife, with whom he has a son. At the same time that he returned to Tagaste, his hometown, to teach, a friend fell sick, was baptized in the Catholic Church, recovered slightly, then died. The death of his friend depresses Augustine, who then reflects on the meaning of love of a friend in a mortal sense versus love of a friend in God; he concludes that his friend's death affected him severely because of his lack of love in God. Things he used to love become hateful to him because everything reminds him of what was lost. Augustine then suggests that he began to love his life of sorrow more than his fallen friend. He closes this book with his reflection that he had attempted to find truth through the Manicheans and astrology, yet devout Church members, who he claims are far less intellectual and prideful, have found truth through greater faith in God. While Saint Augustine is aged 29, he begins to lose faith in Manichean teachings, a process that starts when the Manichean bishop Faustus visits Carthage. Augustine is unimpressed with the substance of Manichaeism, but he has not yet found something to replace it. He feels a sense of resigned acceptance to these fables as he has not yet formed a spiritual core to prove their falsity. He moves to teach in Rome where the education system is more disciplined. He does not stay in Rome for long because his teaching is requested in Milan, where he encounters the bishop Ambrose (Saint Ambrose). He appreciates Ambrose's style and attitude, and Ambrose exposes him to a more spiritual, figurative perspective of God, which leads him into a position as catechumen of the Church. The sermons of Saint Ambrose draw Augustine closer to Catholicism, which he begins to favor over other philosophical options. In this section his personal troubles, including ambition, continue, at which point he compares a beggar, whose drunkenness is "temporal happiness," with his hitherto failure at discovering happiness. Augustine highlights the contribution of his friends Alypius and Nebridius in his discovery of religious truth. Monica returns at the end of this book and arranges a marriage for Augustine, who separates from his previous wife, finds a new mistress, and deems himself to be a "slave of lust." He further describes his inner turmoil on whether to convert to Christianity. Two of his friends, Simplicianus and Ponticianus, tell Augustine stories about the conversions of Marius Victorinus and Saint Anthony. While reflecting in a garden, Augustine hears a child's voice chanting "take up and read." Augustine picks up a Bible and reads the passage it opens to, Romans 13:13–14: "Not in revelry and drunkenness, not in debauchery and wantonness, not in strife and jealousy; but put on the Lord Jesus Christ, and as for the flesh, take no thought for its lusts." This action confirms his conversion to Catholicism. His friend Alypius follows his example. Augustine shifts from personal memories to introspective evaluation of the memories themselves and of the self, as he continues to reflect on the values of confessions, the significance of prayer, and the means through which individuals can reach God. It is through both this last point and his reflection on the body and the soul that he arrives at a justification for the existence of Christ. Augustine analyzes the nature of creation and of time as well as its relation with God. He relies on Genesis throughout this book to support his thinking. Through his discussion of creation, Augustine relates the nature of the divine and the earthly as part of a thorough analysis of both the rhetoric of Genesis and the plurality of interpretations that one might use to analyze Genesis. Confessions was not only meant to encourage conversion, but it offered guidelines for how to convert. Saint Augustine extrapolates from his own experiences to fit others' journeys. Augustine recognizes that God has always protected and guided him. This is reflected in the structure of the work. Augustine begins each book within Confessions with a prayer to God. For example, both books VIII and IX begin with "you have broken the chains that bound me; I will sacrifice in your honor." Because Augustine begins each book with a prayer, Albert C. Outler, a Professor of Theology at Southern Methodist University, argues that Confessions is a "pilgrimage of grace [...] [a] retrac[ing] [of] the crucial turnings of the way by which [Augustine] had come. And since he was sure that it was God’s grace that had been his prime mover in that way, it was a spontaneous expression of his heart that cast his self-recollection into the form of a sustained prayer to God." Not only does Confessions glorify God but it also suggests God’s help in Augustine’s path to redemption. Written after the legalization of Christianity, Confessions dated from an era where martyrdom was no longer a threat to most Christians as was the case two centuries earlier. Instead, a Christian’s struggles were usually internal. Augustine clearly presents his struggle with worldly desires such as lust. Augustine’s conversion was quickly followed by his ordination as a priest in AD 391 and then appointment as bishop in AD 395. Such rapid ascension certainly raised criticism of Augustine. Confessions was written between AD 397–398, suggesting self-justification as a possible motivation for the work. With the words "I wish to act in truth, making my confession both in my heart before you and in this book before the many who will read it" in Book X Chapter 1, Augustine both confesses his sins and glorifies God through humility in His grace, the two meanings that define "confessions,"  in order to reconcile his imperfections not only to his critics but also to God. Much of the information about Augustine comes directly from Augustine’s own writing. Augustine’s Confessions provide significant insight into the first thirty-three years of his life. Augustine does not paint himself as a holy man, but as a sinner. The sins that Augustine confesses are of many different severities and of many different natures, such as lust/adultery, stealing, and lies. For example, in the second chapter of Book IX Augustine references his choice to wait three weeks until the autumn break to leave his position of teaching without causing a disruption. He wrote that some "may say it was sinful of me to allow myself to occupy a chair of lies even for one hour." In the introduction to the 1961 translation by R.S. Pine-Coffin he suggests that this harsh interpretation of Augustine’s own past is intentional so that his audience sees him as a sinner blessed with God’s mercy instead of as a holy figurehead. Due to the nature of Confessions, it is clear that Augustine was not only writing for himself but that the work was intended for public consumption. Augustine’s potential audience included baptized Christians, catechumens, and those of other faiths. Peter Brown, in his book The Body and Society, writes that Confessions targeted "those with similar experience to Augustine’s own." Furthermore, with his background in Manichean practices, Augustine had a unique connection to those of the Manichean faith. Confessions thus constitutes an appeal to encourage conversion. ^ Chadwick, Henry (1992). St. Augustine, Confessions (2008 ed.). Oxford University Press. p. xxix. ISBN 9780199537822. ^ Saint Augustine (Bishop of Hippo.) (2006). Confessions. Hackett Publishing. pp. 17–. ISBN 978-0-87220-816-2. ^ Chadwick, Henry. Confessions. Oxford University Press. p. 4 (ix). ISBN 9780199537822. ^ Saint Augustine (Bishop of Hippo.) (2006). Confessions. Hackett Publishing. p. 18. ISBN 978-0-87220-816-2. ^ Bourke 1966, p. 158. ^ Bourke 1966, pp. 193–94. ^ Bourke 1966, p. 194. ^ Bourke 1966, p. 225. ^ Bourke 1966, p. 262. ^ Bourke 1966, pp. 455–56. ^ Saint Augustine of Hippo (1961). Confessions. Harmonds worth Middles ex, England: Penguin Books. Book IX, Chapter 1. ^ Outler Introduction 1955, p. 5. ^ Saint Augustine of Hippo (1961). Confessions. Harmondsworth Middlesex, England: Penguin Books. p. Book X, Chapter 1. ^ Outler Introduction 1955, p. 7. ^ Saint Augustine of Hippo (1961). Confessions. Harmondsworth Middlesex, England: Penguin Books. p. Book IX, Chapter 2. ^ Pine - Coffin, R.S. (1961). Introduction to Confessions. Harmondsworth Middlesex, England: Penguin Books. p. 12. ^ Brown, Peter (2008). The Body and Society. New York: Columbia University Press. p. 388. Augustine Confessions, Trans. Vernon J. Bourke. Washington: Catholic University of America Press, 1966. eBook Collection (EBSCOhost). Web. 18 Feb. 2016. Augustine. Introduction. Confessions and Enchiridion. Ed. and Trans. Albert C. Outler. Library of Christian Classics, 7 Vol. Philadelphia: Westminster Press, 1955. Print. Brown, Peter. Augustine of Hippo, reprint edition. Berkeley: University of California Press, 2000. Brown, Peter. The Body and Society: Men, Women, and Sexual Renunciation in Early Christianity, Twentieth Anniversary edition. New York: Columbia University Press, 2008. Augustine. Confessions. Trans. Pierre de Labriolle. 3rd ed. Paris: Société d'édition "Les Belles Lettres," 1969. Print. Collection des Universités de France . Image Books, trans. John K. Ryan (New York: Image Books, 1960). Christian Classics, trans. Albert C. Outler (Philadelphia: Westminster Press, 1955). New Advent, trans. J.G. Pilkington (Edinburgh: T. & T. Clark, 1886). Georgetown, trans. E.B. Pusey (Oxford : J.H. Parker; London: J.G. and F. Rivington, 1838). E.B. Pusey's 1838 Translation: Revised 'you' version (2012) by Cormac Burke . New City Press, trans. Maria Boulding, O.S.B. ; ed. John E. Rotelle, O.S.A. (Hyde Park, NY: New City Press, 1997). Saint Augustine of Hippo. Confessions, translated by R.S. Pine–Coffin. Harmondsworth Middlesex, England: Penguin Books, 1961. Augustine. Confessions: A New Translation by Sarah Ruden. New York: Modern Library, 2017. "An Introduction to Augustine's Confessions", by James J. O'Donnell.